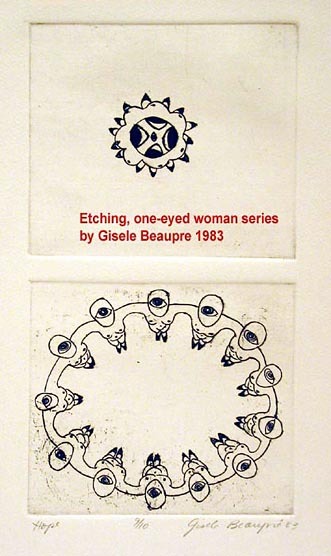 This series, specifically this print was also influenced by Inuit Art. The arrangement of the figures is reminisent of an Inuit blanket toss. My motivation here was to express our interconnectedness. Personal identity has evolved into cosmic vision, that is inclusive of community and the individual self. Fifteen years later, I found an approximation, or a similar visual concept in the teachings of Krishna within the scripture, the Bhagavad Gita. "Arjun, your physical eyes are not capable of seeing Me in My universal form; therefore, I shall open your divine eye, which will enable you to behold all My glories and powers of Yog....Arjun was astonished to see the Supreme God, possessing multiple mouths and eyes...Arjun saw the whole universe with all its manifold divisions concentrated at one place in the person of Lord Krishn...O Lord of the universe, I see You as having innumerable arms, bellies, mouths, eyes and countless other foms, extending on all sides...while the universe lovingly enjoys the chanting of Your names, virtues, and glories...I see that these are all Your own manifestations."